Our top pick for the best hiking pants is the Prana Stretch Zion. Combining both style and substance, the Prana Stretch Zion are both comfortable and practical. The specially designed, 4-way stretch fabric provides a great level of mobility. The lower leg of these can be rolled up and secured with a snap closure which means warm weather hiking is a pleasure. The DWR finish on these pants is also high quality, meaning if you get caught in a light rain shower, the Prana Stretch Zion will do a great job of keeping you dry. The Outdoor Research Ferrosi Pant came in as a close second, as our Step Up Pick. These comfortable pants are exceptionally breathable as well as being made of a high quality, durable fabric. They include many great features, including elasticated cinches at the bottom of the leg, which you can tighten around your calf if the weather gets hot. The subtle pockets on this option also mean that you can easily wear the Outdoor Research Ferrosi around town too, making them a great, flexible choice. If you’re looking for the best Budget Pick, then you can’t go past the Patagonia Quandary. These pants are also the only ones we reviewed which mention they’re made from a blend that includes recycled fibers. The lightweight fabric of the Patagonia Quandary is combined with a good level of mobility and excellent water resistance thanks to their quality DWR finish. While these pants don’t have quite as many features as our Top Pick, they offer great value for money. Selecting the best pair of hiking pants for your needs an sometimes feel like an overwhelming choice. With so many brands out there offering a wide range in different fabrics, fittings, colours, and with so many different features to choose from, finding the perfect pant can be a bit of a minefield. With hiking pants forming an integral part of your outdoor gear, it’s important to make the right choice. And that’s where we come in. We’ve scoured the market for the best hiking pants for a variety of situations, from summer hikes to winter trails, and budget options if you don’t want to break the bank. Many manufacturers offer a wide variety of different hiking pant, all of which include a range of practical and technical features designed to make your hikes even more enjoyable. So, let’s take a look at some of the features which you’ll want to pay attention to when making your choice. The best hiking pant can help you explore in comfort. Hiking pants can be broadly split into three categories – full-length, convertible and roll-up. The best choice you make of which to select will depend on factors including where you hike, which seasons you hike in, and of course, your personal preferences. Let’s look at each of those categories and some of their distinguishing features. These are your standard full-length hiking pants. This style of pant typically contains less features (and therefore less weight) than convertible or roll-up options, meaning they are the best lightweight choice for hiking in cooler climates. Although of course you do have the option of rolling the lower leg of these pants up, they very often work their way loose. This is unlike a roll-up pant, which we talk about further down in this article. Full-length pants are definitely your best bet if you’re hiking trails which are surrounded in parts by tough and prickly vegetation, and they will help protect your legs from cuts and scratches. If you select a lightweight pair then they’re also a great choice for summer hikes at altitude, where the risk of getting sunburnt is much greater. A pair of full-length hiking pant, with a variety of pockets that will see you through many hikes. Convertible pants do exactly what their name suggests – they are essentially two pairs of pants in one. Converting from a full-length pant to shorts thanks to a strategically placed zip which usually sits somewhere on your thigh. Many hikers love the convenience that these offer, especially if you’re on a long multi-day hike and are conscious of the amount of gear you’re carrying. Others definitely don’t like them at all, finding that once they’re in shorts or long pants for the day, they’re unlikely to feel the need to change. The zipper on the thigh can also feel uncomfortable to some people, but I find after a few miles I forget it’s even there. Be aware though, that slim fitting convertible pants often won’t fit over your hiking boots or even chunkier hiking sandals, so you’re then stuck with the dilemma of how to remove the lower leg section once it’s been unzipped. You may have to stop, remove your boots and then take off the zippered section of your pants. Some convertible pant options now do offer a shorter zip at the bottom of the pant, so you can fit them over your boots. If you like the idea of convertibles, this is a feature well worth looking out for. I have often taken convertible pants with me on multi-day hikes as well as when backpacking, but this was more from the perspective of saving weight than being able to convert them from trousers to shorts during the day. A roll-up pant gives you the choice of rolling and then securing the lower part of your pant around your calf. While of course it’s true that you can roll up any hiking pant, if there’s no way of securing the roll-up, it will inevitable end up working its way loose. Roll-up pants get around this problem by either using a small tab and button to secure the extra material, or a small piece of elastic bungee cord. Being able to roll the bottom section of your pant up on a hot day is a great way to get a little bit more ventilation around your ankles and lower legs, without having the bother of either using a convertible pant or changing into a pair of shorts. Let’s take a look at each of those features in a little more detail. This is a coating which is applied to a fabric to improve its ability to repel water. This coating is now used for many different brands of hiking pant, especially those designed for use in colder weather. The DWR coating causes the water to ‘bead’ and run off the fabric, rather than sinking in. While this is definitely a feature you want to look out for in a hiking pant for cold and wet weather, it won’t protect you from a heavy downpour. The DWR coating will wear off over time, but can be re applied to maintain the water repellency of your pant. I usually treat my hiking pants at the end of the spring season, so that by the time autumn rolls around they’re already prepared and ready for hiking in wetter weather. Take note of the style of any hiking pant you’re interested in to make sure they suit your needs. If you prefer a looser fit, this can sometimes mean you have a wider range of movement and can scramble up steep sections of trail or complete a short period of rock climbing with ease. If the fit is too baggy for your frame however, this can cause the extra material to become irritating. Some hikers prefer a slimmer fitting pant, but be aware that these can cause you to feel a bit more constrained, especially when climbing steep ascents with lots of steps. If you do like the look of the slimmer fitting options, be sure to look for features like added spandex for flexibility. Also check the knees have articulation seams to allow for a full range of movement. Most hiking pants will also become looser as the fabric softens and you wear them in, so that’s something to bear in mind too. Hiking pants that fit well are comfortable even on long distance hikes. The number and location of pockets is something to bear in mind when you’re selecting the best hiking pant for your needs. The majority of hiking pants come with at least four pockets – two hip pockets on the front and two pockets on the back. Many also offer either cargo style pockets which sit on the exterior of the pant, or another integrated, slimline pocket sitting somewhere on the thigh. Cargo style pockets on the thigh are very useful for carrying small items. If you like to carry a few key items close at hand, then a hiking pant with larger cargo pockets can be very useful for stashing smaller items such as small tubes of sunscreen, a compass or pocket knife. On the other hand, if you know you rarely use pockets on your hiking pant, then the extra material and weight will be unnecessary. Some brands, notably European ones such as Fjallraven, will often include extra pockets for items such as a survival knife or small hatchet. An integrated belt is a great feature which is often found on the best hiking pants. These belts are usually tucked within the waistband, so you’ll likely only see the small, lightweight buckle or clip at the front. Some are even just a drawstring which you can tie to fit. A great advantage of this is that you don’t need to worry about packing an additional belt to ensure a great fit. When carrying a backpack, belts can often interfere with the hip belt system of the backpack, as they usually want to sit in just the same place! This can become uncomfortable, and mean you end up forever adjusting things to try and stay comfortable. The smaller, integrated belt of some of the best hiking pants doesn’t have such a large buckle as many aftermarket belts, so avoids this problem completely. Another reason to look out for a pair of hiking pants with an integrated belt is if you’re heading out on a thru-hike, or even backpacking. On these trips, not only will you want to keep your backpack as light as possible, you’ll probably also find that your own weight decreases as you continue your trip! That means that a pant which fitted perfectly at the start of your trip may well become looser as the days go by. By selecting the best pair of pants with an integrated belt, you can save on extra luggage and also ensure the perfect fitting pair of pant for the duration of your trip. If you’re mainly hiking in hotter climates, then the breathability of your hiking pants will make you feel much more comfortable.By allowing sweat to escape, a breathable pant will keep you feeling cooler. 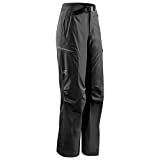 Some hiking pants will also offer mesh sections around pockets and behind your knees, to help increase airflow. Of course, you can also look out for a roll-up pair of hiking pants which will allow a nice cool breeze to circulate around your lower legs. UPF stands for Ultraviolet Protection Factor, and gives an indication of how good a job a particular garment does at protecting you from the sun’s harmful rays. Pants with a higher UPF rating will offer the best level of protection. The UPF is achieved through a variety of methods, including the type of fabric, chemical treatments, and dyes. Using fabrics such as polyester and nylon, which both have a dense weave, will help repel the sun’s rays. Some manufacturers add a chemical treatment to their fabrics which provides the UPF. Finally, the use of particular dyes can increase the UPF rating. Choosing a hiking pant with the best UPF rating can be of benefit if you’re hiking in locations where sun exposure can be higher, such as at altitude, nearer the equator, or at snowfields. As with sunscreen, the higher the UPF rating, the better the protection. This last one might seem strange, as many people assume you just select the color of pant you like the most and that’s that. In fact, the color of pant you choose should definitely be influenced by the type of hiking that you’re going to be doing. If you’re planning on hiking in the winter, then a darker pair of pants will absorb more heat radiation from the sun, which will help to keep you warmer. For hiking in warmer weather conditions, paler colors like beige or stone are better suited. Because these colors reflect more light and heat radiation than they absorb, they can help to keep you feeling cooler. 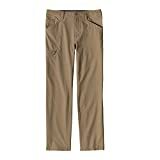 I actually choose to have two pairs of my favorite hiking pant – one in a light beige and another in navy. Depending on the time of year, and temperature I select the color which is best suited to the conditions I’ll be hiking in. A dark colored pant is best suited to hiking in cooler conditions as they will absorb more heat from the sun, helping to keep you warm. We selected the Prana Stretch Zion for our pick as the best hiking pant available on the market today. One of the best features of these pants is the comfort and flexibility that the stretch fabric offers, thanks to its mix of 97% nylon and 3% spandex. The Prana Stretch Zion also feature a low profile integrated belt which helps to ensure the perfect fit without having to add a belt. The soft and stretchy fabric of these pants helps keep you comfortable whether you’re hiking a simple trail, or clambering up steep trails and even indulging in a spot of rock climbing or pre-hike yoga. The subtle style of the Prana Stretch means you could easily wear these for a day out in town without looking like you’re heading out on the trails. While they’re packed full of the best features which make them perfect for hiking, these don’t stand out which gives this pant the most versatility of any we reviewed. They also come with five pockets: two on the rear and three on the front. This includes a zippered cargo pocket on the side of the trouser leg. The fact that this is zipped means its excellent for storing more valuable, small items, without worrying about them falling out. This pocket also has the unique feature of having two zippered openings – one on the top of the pocket and the other on the side. While this might seem confusing at first – it comes into its own if you decide to go rock climbing in these pants. The side zipper allows easy access to the thigh pocket when you’re sitting in your climbing harness, meaning if you want to slide out your phone for that perfect shot from up high, you don’t need to worry about your valuable items falling as you try to extract them from your pocket. Available in a dazzling array of 10 colors and 5 leg lengths, you’re almost guaranteed to find the best combination for you. This pant also offers an option to roll the lower leg section up, and secure this in place with a snap closure. For the quality and number of features the Prana Stretch Zion offers, you might expect a high price tag, but the Prana Stretch Zion comes in at a very reasonable price under $100 which offers great value for your money. These have over 1000 reviews on Amazon, which are overwhelmingly positive. From rock climbers to backpackers, thru hikers to city dwellers, almost everyone who buys the Prana Stretch Zion seems to love them, and we can see why. While the Prana Zion Stretch does come with ventilation holes in the gusseted crotch, these aren’t super effective so in warm weather these pants may feel a little too hot. Although these pants are treated with a DWR finish, in our opinion it’s not the most effective. This means if you’re caught out in a heavy rainstorm this pant won’t be the best at protecting you from getting wet. We definitely don’t think either of these flaws are deal breakers – in fact the Prana Stretch Zion is still the best option if you’re looking for a versatile pant perfectly suited to hiking as well as many other activities. As our step-up we selected the Outdoor Research Ferrosi Pant, which comes pretty close to our top pick in terms of performance and features. Featuring a fabric blend of 86% nylon and 14% spandex, with 90D ripstop meaning they’re durable as well as comfortable for a wide range of outdoor activities. The cut of this pant is somewhere between loose and slim-fitting, which makes them super comfortable for the majority of users. The five pockets on this pant offers plenty of room for storing essentials. Bungee cords at the bottom of the leg cuffs means you can secure these pants higher up your leg to increase ventilation. These pants are exceptionally breathable, making them one of the best choices for hiking in warm or humid conditions. This breathability is a bit of a double-edged sword, as it means that they won’t keep you as warm on cold, windy days. There’s also the option to secure these pants around your calves or just below the knee, using the integrated bungee cords at the bottom of each leg. The DWR finish on the Outdoor Research Ferrosi is reasonable, so you can feel confident that they’ll keep you dry should you run into some unexpected light rain. In a heavier downpour, the water does have a tendency to soak into this pant, but an added bonus is that the lightweight material means that they will dry off extremely quickly should this happen! One thing to bear in mind about the Outdoor Research Ferrosi is that it’s only available in one inseam length of 32”, so if you’re above or below average in terms of height, you’re a bit limited with this pant. Reviewers also note that the waist sizes on the Outdoor Research Ferrosi tend to come up a bit large, so be prepared to wither take a size smaller or wear a belt. As a budget pick, Patagonia Quandary is a great choice. These pants are made from a mix of 94% nylon and 6% spandex which makes for a comfortable fit which allows for a full range of motion when combined with the front and back knee articulation seams and gusseted crotch. If you’re environmentally conscious as well as enjoying the outdoors, this pant is a great choice for you, as 64% of the nylon is recycled. The Patagonia Quandary sits on your waist with a standard rise, and are designed with a slim to straight fit. It’s also easy to find the perfect fit, thanks to the drawstring within the waistband which allows for fine adjustments. The seat and thigh area is cut specifically a little looser than normal which makes scrambling up and down steep sections of trail a breeze. The curved waistband of these pants is specifically designed to follow the natural shape of your hips, which helps keep them in place when you’re hiking. Another great feature of the Patagonia Quandary is that they offer the best sun protection of UPF 50, which is perfect if you hike in hot conditions or at altitude where the UV rays can be stronger. These pants are slim-fitting, with some reviewers commenting that they don’t accommodate larger built hikers as well as some other brands with a broader cut pant. So that’s something to bear in mind depending on your build. With that said, this pant offers excellent value for money combined with a range of practical and well-thought out features. The Patagonia Quandary offers some protection against rain, and will repel a light shower with ease. The slightly thinner fabric of the Patagonia Quandary makes them perfect for hikes in spring, summer and autumn but they would be a bit chilly on their own in winter. Our choice as the best hiking pants for women is the Arc’teryx Women’s Gamma LT Pant. These are made from a mix of 12% elastane and 88% nylon, meaning they are are stretchy. This means they’re perfect for steep trails where you need a high level of mobility. The articulated knees on these pants also help you to step or scramble up steep sections of trail with ease. The trim fit means these look fashionable as well as functional. These are available in a wide range of both waist sizes and leg length, meaning you should be able to find the perfect size for you. Some reviewers have noted that the sizing on these does come up small, so that’s something to bear in mind. Coming in a choice of five different colors, the softshell material of this pant is perfect for spring, autumn and winter. You might find them just a little on the thick side for summer hikes. From a weather resistance point of view, the Arc’teryx Women’s Gamma LT are the perfect choice. They’re not fully waterproof, but the water repellent DWR coating does a great job of protecting you from the elements. The Arc’teryx Women’s Gamma LT pant is one of the most durable on the market, meaning that while these are a relatively expensive choice, you can be sure they’re a long-lasting and hard-wearing hiking pant. These pants come with two deep, zippered pockets to the front, as well as two streamlined thigh pockets, and an integrated belt which helps you get the best fit on your waist. The cuffs of these hiking pants have elastic on the inside, so you can draw them in tight to keep dirt or dust out. In warmer weather, it also means you can pull the bottom of the pant up around your thigh and secure there with the elastic. There’s also a set of grommets in case you want to secure the pants to your boots and create a makeshift gaiter in wet or muddy weather. If you’re looking for a convertible pant that can take you from cool fall hikes, all the way through to summer trails, then we recommend The North Face Paramount Trail Pant. These are particularly well suited to multi-day hikes, backpacking and trails over rough terrain, thanks to their hard-wearing, 100% nylon fabric. This thicker material can make them a little warmer, which is where the convertible leg feature becomes invaluable. The North Face Paramount pant also cleverly incorporates vertical zips at the bottom of the legs, which completely eliminates the need to remove your boots when converting this pant to shorts. The North Face Paramount Trail pant is also very reasonably priced, especially considering the number of features they offer. The cut is on the slim to loose side, making them extremely comfortable to wear. They feature a DWR coating designed to keep you protected from light showers, as well as being quick to dry should you find yourself caught in torrential rain or needing to give these a quick rinse if you’re backpacking. The number of pockets The North Face Paramount Trail offer is impressive – with two open front pockets, one zipped front coin pocket, one rear pocket secured by a zipper, and two cargo pockets! One of the cargo pockets is secured with a zipper, and the other has velcro closure. A UPF of 50 means you’re also going to be well protected on sunny days, although we find these pants a little hot for spring and summer. Another very clever feature The North Face Paramount Trail offer, and the only time we’ve ever seen this, is color coded zippers for each leg. This means there’s no confusion when you’re replacing the lower leg section of your pants – simply match up the blue and red zippers for a speedy change! Available in five practical colors and three leg lengths, these pants also come with an elasticated waistband with an integrated belt. The best convertible hiking pant for women that we’ve found is the Marmot Lobo Convertible Pant. These pants are full of great features, and are made from a blend of 94% nylon and 6% elastane. If you’re looking for the ultimate number of options, then these pants offer the ability to be worn as a standard full-length, rolled-up or as shorts. The choice is yours! This fabric breathable and flexible, allowing you to feel cool and comfortable even when tackling tricky sections of trail. The Marmot Lobo is treated with DWR which provides an excellent level of water resistance in case you’re caught in a light spring shower without rain pants to hand. On the other end of the scale, the Marmot Lobo Convertible are also UPF 50+ rated, meaning they provide a great level of protection on sunny days. The Marmot Lobo is available in two practical colours – dark steel and desert khaki, meaning that whatever time of year or altitude you’re hiking at, this pant is a great choice. One downside of this pant is that it is only available in one length, of 32”. This means if you’re shorter or taller than average, these might not be the best fit. The zipper on the convertible leg section is noticeable against your skin, but this is a common problem with convertible pants and certainly isn’t a reason to discount these, just something to be aware of. The waistband of the Marmot Lobo Convertible is lined with a thin, soft microfleece, which adds a nice amount of comfort, although there is no integrated belt to help with small adjustments to the fit. If you’re getting a bit warm, but it’s still not hot enough for shorts, simply roll the bottom of these pants up and secure using the bungee cord and button attachment. Easy! If you spend the majority of your time hiking in wet weather, then it makes sense to look for a hiking pant which is going to be able to protect you from the elements as much as possible. Out of all the pants we reviewed, the Arc’teryx Perimeter came out as the best at repelling water. The DWR coating on the Arc’teryx perimeter, combined with the blend of 11% elastane and 89% nylon fabrics, does a great job at helping water bead and roll of the fabric, rather than soaking in. In order to provide such great water repellent properties, we feel the comfort of this pant has been compromised slightly. The synthetic fibers used are not as soft as a blend including some natural fibers, and you may (or may not!) find this blend less smooth against your skin as a result. The breathability of the Arc’teryx is fairly good, however if you choose a darker color for summer hiking you might find you get a little hot. These pants are also available in a range of four colors, including a dark beige which will be best suited to warmer weather. They also come in an unusual ‘iron oxide’ color which is a great option if you’re looking for something a little different to navy or beige. Available in two different leg lengths. One thing to note is that many reviewers have commented on the fact that, similar to other pants by Arc’teryx, the Perimeter pant sizes do come up small. Despite the fact these pants don’t come with an integrated belt, we suggest going up at least one or even two sizes from your usual waist size, in order to ensure a comfortable fit. The UPF of these pants is also not stated, meaning we don’t know how effective these pants will be at protecting you from UV rays. With that said, these pants aren’t best suited to hotter conditions anyway, so that’s not a major concern. If you’re planning on hiking in hot or humid conditions, your best bet is to look for a versatile and convertible hiking pant such as the Columbia Silver Ridge Stretch Convertible pant. which can help protect you against those specific weather conditions. We definitely recommend a convertible pant for warm weather. If you hit an open section of trail it’s great to be able to wear shorts, but if you’re still hiking in the evening when the mosquitoes come out, or hit a part of trail that’s surrounded by prickly undergrowth, the protection of trousers can be very welcome indeed. The Columbia Silver Ridge Stretch pant is made from lightweight mix of 96% polyester and 4% elastane. This combination uses Columbia’s Omni-Wick technology to help pull sweat away through the fabric, leaving you feeling cool, comfortable and dry. The elastane in these pants also give them a nice amount of stretch which allows you to negotiate steep and tricky sections of trail without feeling restricted. These pants also offer a UPF of 50, meaning you can feel confident that you’re well protected from the sun. You’ll find plenty of pockets on these pants to store your small items, including two cargo pockets – one with a secure zipped closure, and one with velcro. All these features certainly don’t mean that the style of the Columbia Silver Ridge Stretch Convertible pant is compromised though – they come in an impressive array of 10 colors and 5 leg lengths, meaning you’re bound to find the best combination for you. The waistband is partially elasticated and comes with belt loops, meaning if you’re between sizes we recommend sizing up for comfort. The classic cut and understated features also mean this pant can easily take you from trail to city street. If you’re looking for a pair of durable hiking pants to protect you on winter hikes, then the Fjallraven Vidda Pro is going to be perfect. These certainly do look and feel quite a bit different to your regular hiking pant, so bear in mind they’re designed to perform in a specific set of conditions. They’re made from a wind and water resistant fabric called G-1000 – which is a blend of 65% polyester and 35% cotton. What sets them truly apart is that this is then covered by a layer of wax. These pants come pre-prepared with a wax coating, although you can also buy a bar of wax for top-up treatments, which we recommend doing once per season. The wax is rubbed into the fabric, before being sealed in place using an iron to seal the wax into the fabric. The Fjallraven Vidda Pro pant is heavier and less flexible than other pants we reviewed, although the roomy fit and articulated knees mean you should still feel like you have a full range of movement. The breathability of this pant is poor, because of the heavy, wax coated fabric. This does, of course, make them perfect for cold weather hiking. They also come with the most pockets of any pants we reviewed, including two large cargo pockets on the left leg. There’s a narrow yet deep pocket, specifically designed for storing a survival knife or other tool. They also have pockets within the knees, into which you can insert padded protection. This would be more suitable for someone working outside in all conditions, but it’s certainly a handy feature to know about! 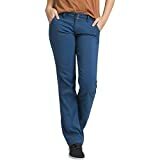 If you’re looking for a flexible and comfortable hiking pant which doesn’t restrict your movement, then the Prana Halle Women’s Pant is the perfect choice. The blend of 97% nylon and 3% spandex give these pants an impressive amount of stretch, meaning you can clamber up steep trails, step into your harness and rock climb with ease, without ever feeling constricted. The articulated knee helps to provide a full range of movement. These pants are made from the same Stretch Zion fabric as our Top Pick. This fabric is designed to be water repellent, quick drying, travel friendly, with a 4-way stretch and a UPF of 50+. With all those features, it’s not hard to see why this fabric is Prana’s best seller. The Prana Halle is also stylish, with a minimal design which can easily blend in to a trip around town without you feeling conspicuous in your hiking gear. If you’re using the Prana Halle in warmer temperatures, the lower leg can be rolled up to just below the knee and secured in place using snap closures. This pant also offers a great range of nine colors and three leg lengths. The waistband of these pants comes with an internal drawstring, so if you’re between sizes, we recommend selecting the larger size. If you want to wear a belt, the Prana Halle also has belt loops. You won’t find the largest range of pockets on these pants, with just two open front pockets and two rear pockets, which are secured with poppers. While these pants are treated with a DWR, reviewers have commented that it’s not the most effective. Now you know a little more about both the main features of hiking pants, and our round-up of the best ones on offer on the market today, let’s compare the ones we’ve reviewed. While we think our Top Pick is the best option for an all-round pant, if you’re looking for a pant specifically designed for wet weather hiking, then it can be really useful to compare the respective features to help you choose the best pant for your individual needs. First of all, and one of the most important features in our opinion, let’s look at the comfort of each pant. There’s no point having a pant which is going to feel uncomfortable after a few hours hiking, even if it does have other features you want, like a high UPF or lots of pockets. Personally, I take the comfort of a pant into consideration first, and then look for specific features that I need. As you can see, from all the pants we reviewed, the two best rated in terms of comfort come from the same brand, Prana. Both of these pants use Prana’s specifically designed fabric, the Stretch Zion, which provides supreme comfort and mobility. Next up, we considered the breathability of each pant. Without this feature, excess moisture from your sweat is likely to build up within the pant, which can become uncomfortable. While it’s obviously important that pants designed for summer have the highest breathability, if you’re hiking in winter this isn’t such an important feature. So, the pants that performed best in this category were, unsurprisingly, those designed specifically for summer. This includes convertible pants with the option to wear as shorts. At the other end of the scale from breathability, we looked at the water resistance of each pant, and which performed the best. Whilst almost all the pants we reviewed had been treated with a DWR, this doesn’t mean that they’re all going to perform as well as each other. Any DWR treatment will wear off over time and when the pants are washed, which is something to bear in mind. I tend to treat my winter hiking pants at the end of the season, before putting them into storage. That way, I know they’re ready for the next year! Out of all the pants we reviewed, one of the best performers in the water resistance category was the Fjallraven Vidda Pro. This is due to the unique method of adding water resistance via a wax coating over the fabric, as opposed to the more common method of treating the fabric with a DWR. The other stand-out pants in this category are both made by Arc’teryx, whose DWR treatment consistently outperforms other brands. Next up, we looked at the UPF sun protection rating of each pant. The majority of pants we reviewed provided a UPF of 50+, meaning you can be confident that they’re going to do the best job of protecting you from the sun’s harmful rays. The pants which didn’t provide a UPF rating were those from the brands Arc’teryx and Fjallraven, all of which are more geared towards use in colder seasons. Lastly, we made a note of how many different colors and leg lengths each of the hiking pants we reviewed were available in. While this might not seem like the most important consideration, it’ most certainly worth taking into account. With regards to the colour of a pant, as we discussed earlier, light colors are better suited to warmer weather, and dark colors are best for winter hiking. While navy and beige used to be the only options out there, many brands now offer a much wider choice of colors, meaning if you feel like opting for a more interesting color you have plenty of choice! Prana and Columbia both offer an impressive 10 different colors of pant. When it comes to leg length, if you’re particularly short or tall then you’ll know that there’s nothing more frustrating than having to put up with trousers that are the wrong length. Again, Columbia and Prana come out offering the best range here, with 5 different leg lengths available from both brands. A quick Google or Amazon search for ‘best hiking pants’ soon brings up an almost overwhelming choice. Many of these didn’t make it into our list of the best hiking pants, for various reasons. Either the fabric was too thin and will be unlikely to stand up to regular use, or the quality of the pockets and stitching is poor. Rather than take a chance on an untested product, we’ve taken the guesswork out of purchasing for you. By choosing one of our recommended options, selected to best suit your individual needs, you can be sure that you’re opting for the best of the best. Your hiking pants should be one of the first things you select when getting ready to hit the trails. I think that, along with your hiking boots and backpack, they are an integral part of your kit. In our opinion, the Prana Stretch Zion easily took the title of Top Pick in our roundup of the best hiking pants. The combination of exceptional comfort, breathability and quality construction make these a winner in our eyes. Add to this the fact that they come in 10 different colors and 5 different leg lengths and you’re looking at a truly versatile hiking pant.